Welcome! My name is Karen and I am so happy that you have stopped by Alaska Blue Moose today whether you just happened in or came along via Vicki's 2015 Grow Your Blog. This is always exciting and I have loved the last two years, joining in the festivities. During 2014 my "blog" didn't grow as much as I would have liked due to recuperation from traumatized muscle tissue (sitting and moving were difficult) - however, all is on the mend with physical therapy and I am totally looking forward to adding energy and love to this area with new photography, projects, and information about Alaska. The sidebar has a little intro on "who I am" and a photo - not too scary - with my Email (kareninkenai@gmail.com - in case it is too small to read). I love hearing from you and hope you enjoy my continuing artistic endeavors. Last year I was in Canada for a month when the GYB launched and was very fortunate to meet the winner of my giveaway on my return trip home. It is always such a thrill to meet new friends this way. I have knitted newborn snuggle sacks, taken jewelry and art classes, exchanged ideas, and initiated or accepted heartwarming friendships by corresponding with those who follow me or those I follow. It is truly a rewarding and inspirational journey. I am thankful for each of you. The link below will take you to Vicki's GYB with over 400 more blogs to visit. Vicki is such a beautiful woman, compassionate and enthusiastic in all that she does. Seeing the gorgeous photos of her and her "gardener's" travels, sharing in her charitable projects, and seeing her own beautiful signature nests and knitting is a feast to our senses. Before you venture away, read about my "GIVEAWAY." 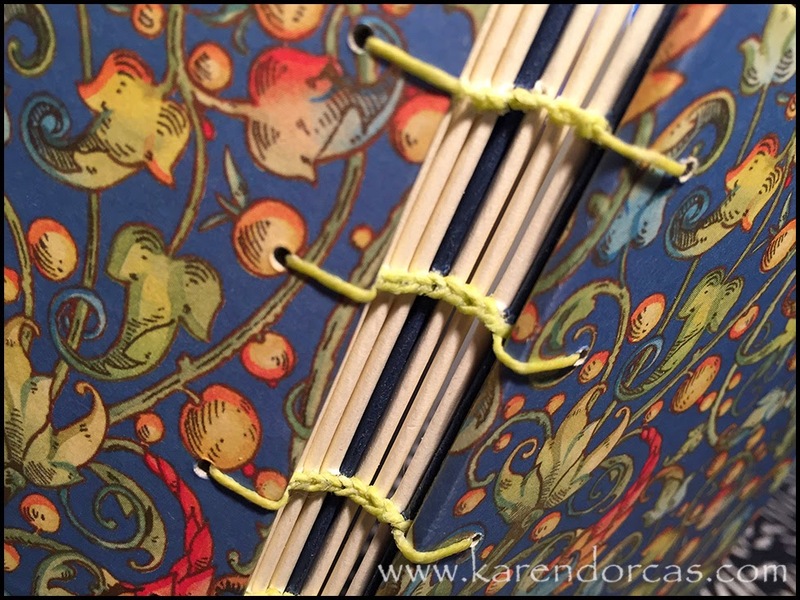 Bookarts, beading and photography have been my longtime passions; adding a renewed interest in fiber arts with lacebooks and knitting the last couple of years. This year I am giving away a journal. I would love to have you follow my blog if you are interested, but you do not have to do so to enter the giveaway; you don't have to live in the United States - all you must do is leave a comment on this post to sign up. (An email to me directly will not enter you for the gift.) I will do a random drawing on February 15, post the winner here and contact you to mail the journal. In order to contact you, please be sure to at least have a means of reaching you via your comment. Please read some of my posts and follow the Grow Your Blog link. room for notes and photos. lovely for your purse or by your computer or to regift. Thank you sincerely for visiting and GOOD LUCK! Visiting via Vicki's GYB party, such a fab way of getting to visit bloggers we've not met before. Glad to hear that you are feeling more like blogging this year, too. Enjoy the party and do try and visit me in Normandy, France soon. BTW would love to enter the giveaway, and have a chance to win your beautiful Journal. I am visiting via the grow your blog party. I am so glad you are feeling better. I was down with bi-lateral pneumonia from Halloween through Christmas so I know how you feel about everything else being on the back burner. Your journal is beautiful. I searched for one recently and one that is as pretty as yours is not easy to find. I would love a chance to be the winner. Also, I am following your blog come visit and follow if you would like. Your journal is beautiful; thank you for the chance! 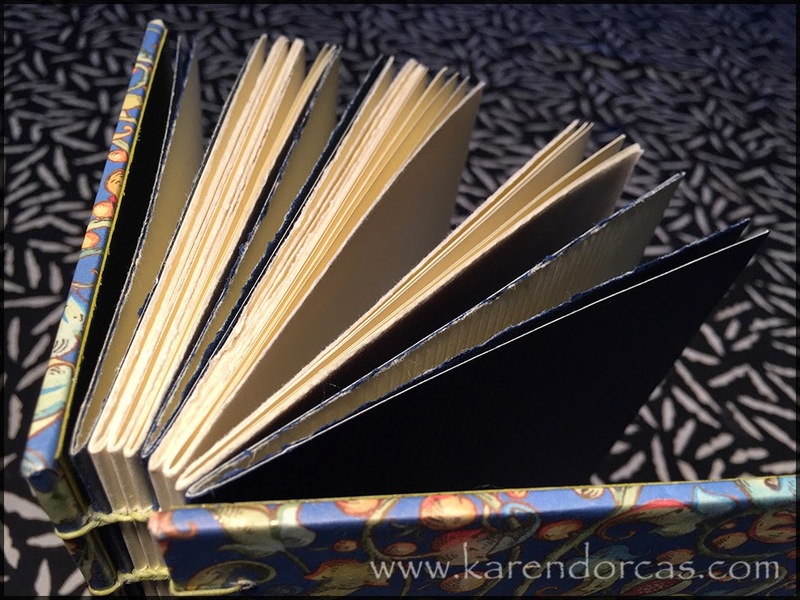 I'm so intrigued with bookmaking and will be back to see more of what you do. What a beautiful journal! I landed here because I follow you on Bloglovin'. Now I need to check out some of those other people...Thanks for the chance to win! Hi Karen, I'm so happy I to get to know your blog, I love all the crafts you are into and your projects are so happy and colorful, I will read you with delight! Hello from Canada. Nice to meet you and I really like your bookbinding technique. This blog hop is wonderful so we can get to know some new artists!! I absolutely adore your work and would love to win your beautiful book. I'm a quilter and don't do anything remotely like your gorgeous work! I love journals and do write in them at times. :) I have plans to visit Alaska some day. My friends who have been to Alaska for work tell me I need to go there to see the beauty for myself. I have made it to 35 of our 50 states and DC so far. 15 more to go. Thanks for the opportunity to visit your blog. Wow the journal is lovely. I would be so excited to win it. I wish I could knit, but I just could never get the hang of it. thanks for your visit as Vicki's rep. What a lot of work you all put into this. Thank you so much. The journal is lovely. Love the name of your blog. Our family was in Alaksa in July of 2011 celebrating our 25th Anniversary and our daughter's graduation from high school. It was so beautiful there and certainly hope to get back one day. Visiting from the Grow Your Blog Party. Lovely to meet you here:) I've always wanted to visit Alaska .... there's something intriguing about the place ... So I'll be following along to see a bit of it from your point of view.. I'm glad you're starting to get better. I've loved today - travelling around the world meeting new bloggers - such a fabulous thing that Vicki has done. And I'd love to be in with a chance to win your lovely hand made book. A really lovely journal, you have already been very busy this year. I've been following you on email, but I've joined the google friend connect group. I have found I like to see all my blogging friends in one place without the disturbance of miscellaneous emails in between. I tend to get side tracked. I hope this help me stay on track. Good luck with meeting and making new friends. Hello Karen, Thank you so much for joining my blog ! It is so exciting meeting new bloggers/artists and I am really looking forward to getting to know you. Thank goodness I found Vicki Boster's 'Grow Your Blog Party' ... this is fun ! Your post is lovely ! Visiting via Grow Your Blog. I'm also a participant. Your journal is lovely. I was looking at a few journals earlier this week that my friend made and can appreciate the work that goes into making them. Such a lovely giveaway Karen! Sorry to hear t hat you had an injury this past year, but glad that you are improved. As we get a bit older, it does take more time to heal. hope that your new year is going well and will be filled with creativity! Beautiful work. Would love to win. Thanks for the chance. Great giveaway and an interesting blog, please pop by and take a look at my blog, I missed out on taking part but am visiting all those who are participating. I still want to get together with you so you can teach me your bookbinding techniques. Maybe this summer if you have time!!!! What a delight to find you and your blog via the GYB party! I share your love of bookarts and beading and look forward to following your posts. And what a fabulous journal giveaway! 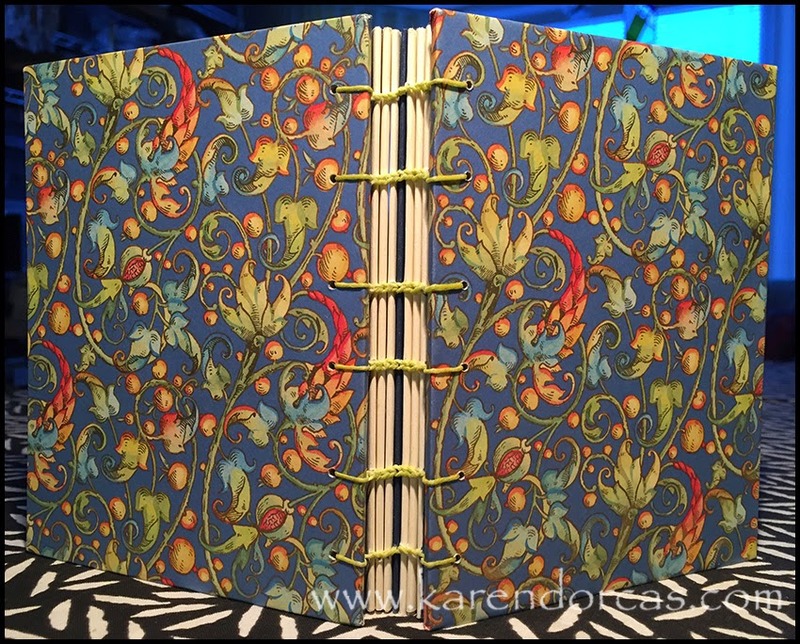 Another beautiful journal! You are one talented lady who I am blessed to count as a dear friend! Hugs to you! Hi Karen - think you for visiting me, and "Joining my journey." Such a lovely and informative place, here! And I am not required to do crafts... thank you. I can be satisfied reading about your adventures, great links, and pretty photos. That journal is something else. Well made... love the material choice. Someone is going to be very lucky to win it - count me in! have a great week (smile). Hi Karen! My name is Kelly and it's so nice to meet you! I've enjoyed reading through your blog! Enjoyed looking through your blog. Thanks for helping ou at the party! I used to dream of moving to Alaska and homesteading. LOL! Now I just love living on my little farm in NJ. We're going to get 24-36 inches of snow over the next few days. That's HUGE for us and I love it! The journal is wonderful - but I don't need to win! I am already a winner - I have you as my friend! Love the journal. Your work, in whatever medium you choose, is always so beautiful. I hope we will have the opportunity of working together on mutual art projects. It's been awhile for me, and I'll have the time after retirement in the spring. You are always an inspiration. It's good to hear you are feeling better. Such a great GYB post here! So great chatting face to face in cyberspace. Looks like you have had so many visitors already. I've seen some lovely new blogs already! That journal is just gorgeous and cute with soooo many pages and it is all your very own work. I didn't blog very much last year but hope to be more on top of it this year as well. I love to meet blogging and online friends in person. It makes the friendships more personal that way. Thank you for the chance to win the journal! Hi Karen i started following you last year and am happy to see you once again. glad to hear your are feeling much better now and am looking forward to seeing more of you this new year. Hi Karen! What a beautiful blog you have, full of such a lovely mix of art! Really fun to read through! Warm greetings from Florida. I'm new to blogging. So glad I found you. Have enjoyed looking at your journal, knitting, recipe, etc, but especially the bowl hot pad protector. The highlight was when you gave the link for the directions! What an angel you are... Now I can "pay it forward" to my quilting group and tell them where I got it!!! How very gracious it was for you to do that... looking forward to seeing you on Ravelry too. Lovely journal! New gfc follower! Glad to meet you..My parents lived in Alaska for a short while, to follow my dad's job.. So nice to meet you and to see your lovely knitting projects. I do a little knitting, but anything I do has to be pretty plain. I have the attention span of a knat so I'm always losing my place in the pattern and then have no idea how to fix it. Have fun on the party! I wish you continued healing! It's nice to meet you during the GYB hop. Following via email now. Have a great week! I really enjoyed scrolling through your blog. I especially love the entrelac scarf - one of my favorite knitting stitches. I love, love, love the journal you are offering. Thanks for the opportunity to win it! Have a wonderful day and enjoy the blog hop. I'm here for the party. I love hearing about Alaska and would love to go there some day. Hi Karen, so nice to meet you. I'm a jewelry maker who dabbles in polymer clay. I enjoy reading your blog and really like the journal you've made. You are very popular. Looks like everyone wants to be entered for that gorgeous book. I can see why, since attention to detail makes it worthwhile, indeed. Sorry to read that you have had a genuine disability. Hope the PT works well. I really enjoyed visiting your blog today. It was a genuine breath of fresh air. I am glad the physical therapy helped, but sorry to hear about the health difficulties you have been having. I hope you are doing well! Hello Karen, pleased to meet you via the GYB hop. Interesting work and beautiful generous giveaway. Its nice to meet you. I would love to visit Alaska some day. Your journal is fabulous - If I'm not lucky enough to win I would love to try and make one for myself! As always Karen, it is so beautiful. Put me on the list. Karen, I am anonymous from above. Hi Karen: I just love those fingerless mittens - do you have a pattern reference for them? Please enter me for the lovely giveaway you will be drawing for. Thanks! Hello Karen, best wishes from Germany. Just poked around a little bit... your journals are wonderful. And I like this hotpad-protector. I am (beside other crafts) a knitter too! All the best for you. Hi Karen, thanks for coming over for a visit and your comments. I think your journal is a great idea for a giveaway, such a practical size. Sending good wishes from New Zealand. Hi! Found your blog via GYB which I too participate for the first time. Love your Raven books and the red/purplish knitted hat for Chris as Xmas gift is just lovely. ♥ it. Nice to read your post. Hope you are enjoying the party and will meet lots of new people! Visiting from GYB, beautiful journal! Alaska sure looks wonderful, someday I'd like to do a cruise there. I have just gotten knowledge of these wonderful journals both in paper and fabric and I am making one! I love them! They are just so "me"!!! I will be following you for inspiration! Thanks for the giveaway! Wishing you a great year to come! So glad you are on the mend. Your journal is lovely! Hello!! Well I joined your blog! Good to hear your on the mend and on board for this year. My adventure with this blog hop...Grow your blog 2015 started off right, then...I transferred my domain and entire blog to another host and everything was a mess for about two weeks!! Everything is perfectly fine now! If you like you can stop by to see what I am about, I see you love knitting as do I! I also crochet and sew. I look forward to meeting you at my place! Hello, Its a pleasure meeting you and learning more about you and what you do. Hi karen! I made the Sheila Fae hat ! But I wonder. Did you block or form yours somehow. ?? Mine looks a bit different. 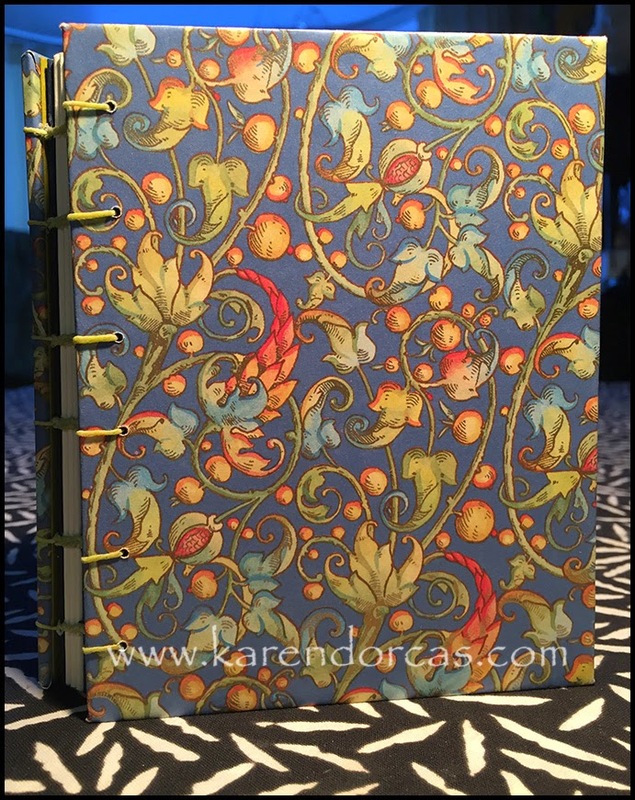 What a gorgeous journal! I bought plywood and carriage screws (the works!) to make my own book press but I've been too shy to build it. But seeing your work is giving me that extra kick to make it happen! Visiting via Vicki’s GYBP and enjoying my visit. So very sorry to hear of your troubles...and pray you're soon on the road to full recovery! Your giveaway is lovely. Wow...that journal is gorgeous! I am gladly following you on GFC as Rose Santuci-Sofranko . God bless! Your work is beautiful. The journal you are gifting is a work of art! Glad to have found you via GYB party. Hi Karen! I am very belatedly visiting from GYB... unfortunately, the flu caught me a couple of days after he event and has wreaked havoc with my so-called "plans" for marathon visiting :( Your journal is a lovely piece of art and sure! I just saw your journal on Facebook and it is absolutely gorgeous and whoever wins it will be very lucky! What really struck me, though is your photo and how much you and Nadine look alike! Two extremely talented sisters.....!